Go-Green 25Oct09 Sunday Campaign Ride. - GGI-Group size: 4000+ Professionals, Increasing on day to day basis, Come & join us 2 serve Mother Nature. Go-Green 25Oct09 Sunday Campaign Ride. Following r the participants participated on our Sunday 25 October 2009's Go Green Campaign Ride. Vasumathi who joined the group recently and completed her first 23 KM here is her experience & which she wanted to share with all of us. It all begins in the mind. If you have the mental strength, you can achieve anything. I have always thought of myself as mentally and physically unfit for activities like running, cycling, trekking etc. I was happy, writing and clicking pictures and leading a sedentary life instead. My better half is an aspiring runner. He tried to inspire me to run. With great difficulty, I started doing 2kms on the treadmill. We then bought a cycle and I slowly started with 3Kms. Went on to 4, and then went on to 6 and then 8. I thought that is it. I have set my benchmark. Beyond this, is not possible. 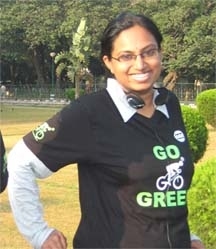 Today, at the Go Green Campaign Ride, I startled myself by doing 23Kms. We all assembled near the Apple iStore JP Nagar at 6.30AM. Started towards Lalbagh and then to JC road and finally Cubbon park. At the start of the ride, there was an uphill @ jayannagar. I was exhausted. I was the last one to tag along and the others were way up ahead. Mr.Rao, caught up with me, and asked if I wanted to take a U-Turn and get back. I said, "No" and kept going. Each time I would slow down, he would catch up and say a few words of encouragement. He shot pictures, took videos and generally kept up the mood of the group. When we reached Cubbon Park, he gave me a huge smile and a thumbs-up saying, "That is it. You have done it.” It made the sweat in my brows worth its while. Life's most profound philosophies will probably realized during an uphill. An uphill is Life's challenges. We struggle and fight with them. We cross them and Zoom off. I met quite a few guys from the GGI group and the conversations around were very interesting. Ranging from cycles to Amitabh Bacchan :). A certain "Aiswarya" will know what I am talking about. The return route was similar with enough ups, to kill me. Mr.Rao again cycled along and was talking constantly. I never realized how I finished climbing one mini-hill! With limbs aching, i reached home to an exuberant husband who was proud, that I managed to complete the ride. (He is the one who knows how terrible i am with my stamina levels). All said and done, I haven't had this much fun in ages. I intend to ride again wearing the Go Green T-Shirts, which is soon turning into a cult, and I must admit, I feel a sense of pride wearing it. I have often heard Balaji say, "Pain is temporary, Pride is permanent". I would hear that, nod my head and move on. But, I know today, what it truly means.